Renegade Holiday Craft Fair in Chicago! Ok, first off? We’re super stoked to be heading back to Chicago to participate in one of our favorite shows, the Renegade Craft Fair Holiday Sale this coming weekend. And secondly? Hello? How adorable and rad is the illustration by Kate Sutton for the sale this year? I just love it, totally wintery and cozy all at once. Anyhoo! We really are just thrilled Renegade Craft Fair Holiday Sale in Chicago again this year. We’ll be there vending with tons of new things and taking in the amazing talent of over 150 artists & crafters. So come on in out of the cold and say hello! For more info, check the Renegade Craft Fair Chicago Holiday Sale <— page here. With over 150 of today’s finest indie-craft talents setting up shop, holiday shoppers are sure to find something for everyone at this FREE TO ATTEND craft, art, design + DIY spectacular! And below are a couple of maps for you too. 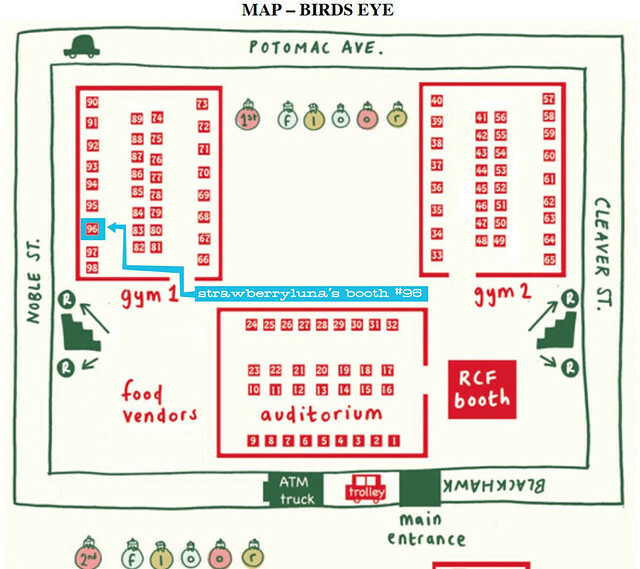 We’ll be vending from booth #96 in Gym #1 (naturally! ), rocking right next to our super-friend Beth from RagTrader Vintage. Where: At the beautiful Pulaski Park Fieldhouse at 1419 W. Blackhawk, in Wicker Park. What: Over 150 indie crafters & artists, all showing and selling their handmade work. PLUS DJs to keep your booty shaking, and amazing food + treats from local favorite restaurants including Flying Saucer, MANA Food Bar, TipsyCake and Treat Restaurant! If you’re seeking Wintertime libations, our bar will be selling beer, wine and warm mulled-wine! And de sure to commemorate your trip to the Fair by getting your photo-snapped in the free-to-use photobooth provided by Magnolia Photobooth Co.! Don’t forget to visit our special Renegade ornament-making workshop or our Welcome Station, where we’ll feature a free-to-enter raffle (prizes furnished by Chronicle Books, Paper Source +Uppercase), free issues of TimeOut Chicago + an extra-special Renegade Holiday photo-op! We hope you’ll join us by hopping on the free-to-ride Renegade Holiday Trolley (click for more details) or by taking public transportation to the Fair! If driving, you’ll need to find street-parking in the surrounding neighborhoods as the venue does not have a lot of their own. Please see our FAQ for details, directions + lots more info! This entry was posted in Craft Shows, News & Events, Poster & Craft Shows and tagged artists, chicago, chicago holiday sale, cool stuff in chicago, craft shows, diy art, free stuff to do in chicago, handmade, holiday shopping, pulaski park fieldhouse, ragtrader vintage, renegade craft fair, shop handmade, strawberryluna by strawberryluna. Bookmark the permalink.